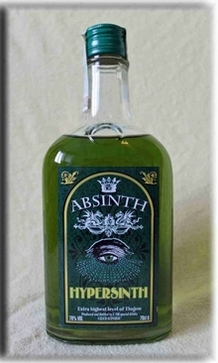 Absinthe is a spirit, which is produced from extracts of wormwood and other herbs. Cause of the content of chemical thujone in the wormwood, which is a toxin, when taken in large amounts, absinthe was forbidden in Germany by law 1923 as a toxic drug. "Absinthe" acquired its name from the latin name for wormwood : "Artemisia absinthium"
Cause of the fact, that modern technic- and analysis-methods let be controlled the risk, this stimulating drink was again admitted with an adjusted content of thujone. The admittance in the European Union, which is valid since 1998, allows a thujone content of 10 mg/Kg. 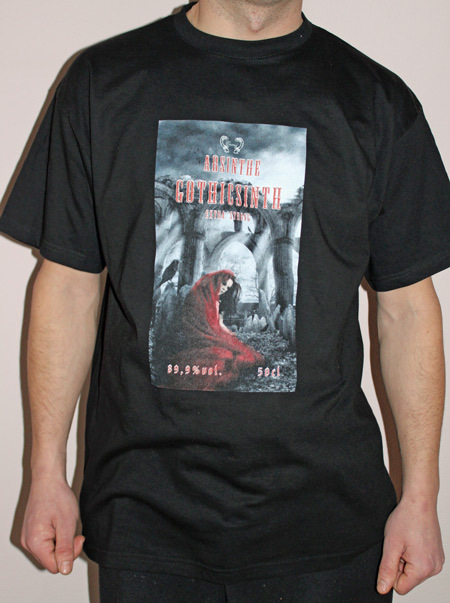 Exception is as "Bitterspirit" declared Absinthe, which is allowed to have a thujone content of 35 mg/Kg. The first Absinthe distillery was opened 1805 by Henri Louis Pernod, whose Pastis beside Ricard and Pastis 51 belonged to the world`s famoust and whose company as stockcorporation Pernod-Ricard was growing up today to one of the biggest Spirit producers of the whole world. Already in the second half of the 19th. century and the early 20th. century this psychoactive drug delighted a great popularity, also at Bohemians as Oscar Wilde, Tolouse-Lautrec, Sarah Bernhardt, Ernest Hemingway und Van Gogh. Only after passionate political arguments Absinthe was forbidden in Switzerland(1908), in France (1914), in Germany (1923) and in some other countries. 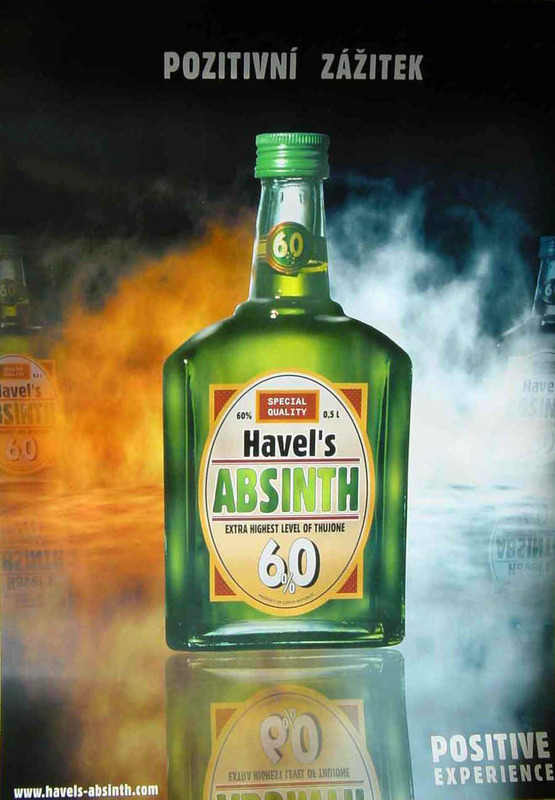 The Absinthe law was abolished in 1981, but the Flavour prescription in the, at that time valid version, has still forbidden the use of wormwoodoil and thujone - Cause of this flavour prescription, real absinthe was still forbidden. The today valid version of the flavour prescription still forbids the use of thujone - but allows the use of thujone containing plants and parts of plants as wormwood herbs (Herba Absinthii) and Beifuss (Herba Arthemisiae) under attention to adjusted maximum values of the resulting thujone-level. That is 10 mg/Kg at normal Absinthe and 35 mg/Kg at as "Bitterspirit" declared Absinthe. Fill 5 cl Absinthe into an Absinthe-glass. Dip a special Absinthe-spoon with a sugar cube on it into the Absinthe so long as there are no ascending bubbles to watch. Lay the spoon with the soaked sugar cube onto the Absinthe-glass and light it. As soon as the flame is extincted and the sugar is lightly caramellised, dip the spoon together with the caramellised sugar into the Absinthe in the Absinthe-glass. Mix the Absinthe and the caramellised sugar-cube with cold water in a relation normally between 1:2 - 1:5. At some Absinthes You will see then a "Louche-effect" (opalisation), which is not the czech tradition at Absinthe. The traditional french drinking preparation: Lay the Absinthe-spoon with a sugar cube on it onto an Absinthe-glass and pour drop by drop cold water from a carafe or a fontaine over the sugar-cube. The sugar will be dissolved after a while. At french Absinthes normally You will watch a higher "Louche-effect", because french absinthe normally has a higher content of anise. 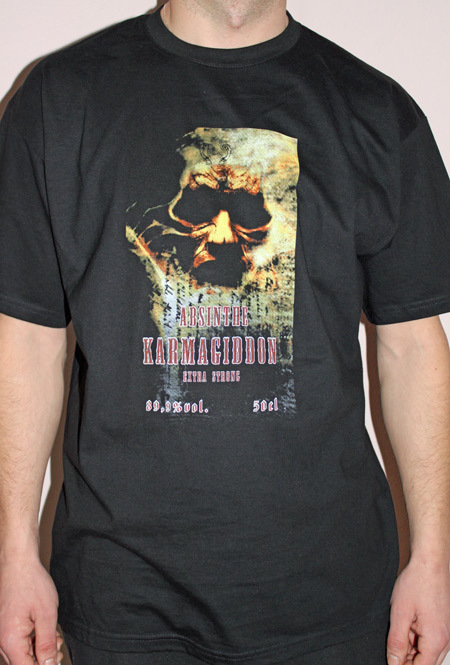 Hemingway f.e. mixed as further version his absinthe with champagne instead of water. fill up with orange-juice up to the individual drinking concentration. Stir well with ice. Strain into a glass. Serve with piece of pineapple on top. First add the Bailey`s Irish Cream, then the Tia Maria, and then carefully the Absinthe: Put the shot on fire and drink it with a straw, or You have another choice: When the shot is on fire You slap it to extinguish the fire and then drink it. Shake with ice and strain into a wine glass. Shake with ice and strain into a Collins glass. First put the Tequila, then the vodka, then the black rum, then the Bailey`s Irish Cream, then the Grenadine syrup and then mix these five elements so that the drink become pink, to finish add the Absinthe using a spoon. Light the shot on fire and drink it with a straw, or You have another choice: When the shot is on fire You slap it to extinguishe the fire and then You drink it. Chill an Old Fashioned glass by filling with crushed ice. In another glass mix the sugar with the bitters dissolving the sugar. Add some ice, stirring to chill. In the Old Fashioned glass remove the ice and pour in the Herbsaint coating the entire glass. Remove the excess Herbsaint. Add the Rye Whiskey and bitters/sugar mixture. Add the Lemon Twist. Shake with ice and strain into a highball glass and fill with seltzer. Frappe in a highball glass. These recipes are provided as a curiosity for the information hungry only. We cannot vouch for the tastiness of the recipes mentioned, and even the safety of quaffing such elixirs is suspect.